Life hasn’t treated Lazarus Jones well. He lost a lot in Vietnam including both legs and the rest of his platoon. The years since have been filled with drugs, alcohol, war flashbacks and his only shining light – the ever-loving, Chris. But, when a car accident puts him in a coma, Laz discovers an all-new direction for his life. While his body lays immobile in our world, his spirit is transported to a star system called Abraxas where he’s united with Steven J. Huff, Munoz Slaw and Captain Archibald Engle – his entire squad – now entangled in an all new war: the war between Light and Dark. As part of the Light Brigade, Laz and his pals are embroiled in just one of the many battles in the Light and Darkness War. However, their fight against Lord Na of the Darkness remains an important one. Utilizing the technology of Nicholas Tesla (Nikola Tesla’s nephew), Na has discovered a way to gain access to Earth – a notable concern since passage to Earth has long since been lost. Earth weapons will play a significant role in this war fought with wood and stone weapons devised by Leonardo Da Vinci. Perhaps even enough to swing the entire war in favor of Darkness. Fearing an imbalance in weaponry, the Forces of Light seek the aid of Nikola Tesla (the legendary inventor from the 19th & 20th centuries) to equalize the playing field. But, just when the Forces of Light need all the help they can get, Lazarus awakens from his coma – returning to Earth and leaving the war far behind. Was it all just a big dream? And, if it’s not – how can he rejoin his friends and win the war? The Bad: It seems Cam Kennedy tried out some experimental art styles with cover #3 & 6 that just don’t match up to the quality of the other four covers. The Good: Tom Veitch has found a way to acknowledge the true warrior spirit of the average Vietnam Vet by placing him in a war where the forces of good and evil are more clearly defined. The Verdict: The Light and Darkness War starts off with a great concept. It pitches the spirits of Earth’s warriors into an afterlife filled with an ageless battle between two extremes: good and evil. There is no question which side is the right side to root for and it’s in this backdrop that Veitch attempts to redeem the Vietnam Veteran (who were initially scorned for their involvement in a war many Americans felt we should never have engaged in). But, that’s where an important difference should be noted – and Veitch certainly wants you to be aware that even if you don’t support the war, you can still support the troops. 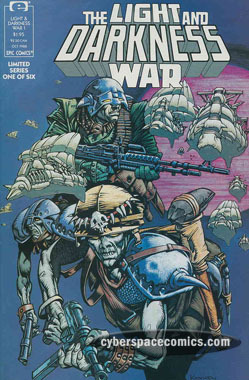 By taking the Vietnam Veterans of this story and pitting them against the Forces of Darkness, Veitch gives the Vets an opportunity to show their true spirit and moral character – without the question of “Is there just cause for this war?” hanging over their heads. Cam Kennedy’s art breathes life into this strange world filled with the spirits of Earth warriors and Leonardo Da Vinci’s flying stone ships (as well as other interesting inventions). Incorporating legendary inventors like Da Vinci and Tesla was a neat idea (one that Hickman has recently used in his ongoing S.H.I.E.L.D. series), as was the travel between Earth and Abraxas. And, even though Laz’s eventual return to Earth was expected, it played out nicely. His despair over losing his friends again and returning to the life he had loathed so much was quite palpable. By the end of the series, he seems to have everything all figured out – and you just can’t help but feel happy for the guy.